"This super-easy version of pot pie is in the oven in just 10 minutes." Heat oven to 425 degrees F. Make pie crusts as directed on box for Two-Crust Pie, using 9-inch glass pie plate. In medium bowl, stir together cooking sauce, flour, poultry seasoning, 1/2 teaspoon salt and 1/4 teaspoon pepper until smooth. Stir in vegetables and chicken. Spoon into crust-lined pie plate. Top with second crust; seal edge and flute. Cut slits in several places in top crust. Get a head start on classic beef stroganoff. This is a great recipe to use up leftovers. Chop leftover chicken or turkey, and use in place of deli chicken. Poultry seasoning is a blend of thyme, sage, marjoram, rosemary and a little black pepper. My husband (my toughest critique) said it the best, "I didn't even know I like chicken pot pie or maybe I've never had one this good!" Yummy! I added a can of diced potatoes, but will make it next time with just a sprinkle of pepper and no salt (tasted too salty) and maybe a 1/8-1/4 cup of water. Feeding 5 kids and 3 adults after working all day, BRAVO!! Fast prep time and done and to the table in a whip! 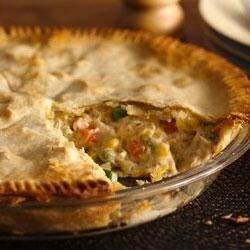 Everyone loved it and the 5 year old said "I never knew pot pie could be so good!" For a quick version, this is very good. The sauce was thin, but tasty.